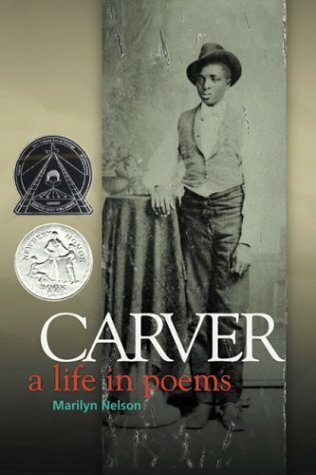 Marilyn Nelson’s volume of poetry, Carver, illuminating the life of George Washington Carver is both beautiful and engaging. Her poems lovingly present the mind of the great inventor and teacher in addition to giving voice to those who knew him, loved him, or benefited from his generosity and genius. For example, Nelson creates the voice of a loving foster mother, of a dedicated student, and of a once hopeless farmer who has finally yielded a good crop because of Carver’s suggestions. By portraying Carver himself and a multifarious cast of characters, Nelson is able to create a convincing portrait of Carver’s life and insight into his discoveries and faith. Throughout the volume of poetry, Nelson emphasizes Carver’s faith in God and love of nature as the inspiration for his agricultural and self discoveries. The poem “Four a.m. in the Woods” reads “As shadows take shape, the curtains part/ for the length of time it takes to gasp,/ and behold, the purpose of his/ life dawns on him.” It is here that Nelson yokes Carver’s love of nature and of his fellow man, and those two great loves will form the framework of the remainder of his life in the text. Even as he makes discoveries and creates products, it is Carver’s life purpose to aid fellow African Americans, descendants of slaves, which guide his decisions, such as giving away his formulas and recipes for free. His role as teacher and inventor will lead him to the Tuskegee Institute, where Nelson’s father will become one of the Tuskegee Airmen, thus inspiring this volume of poetry.